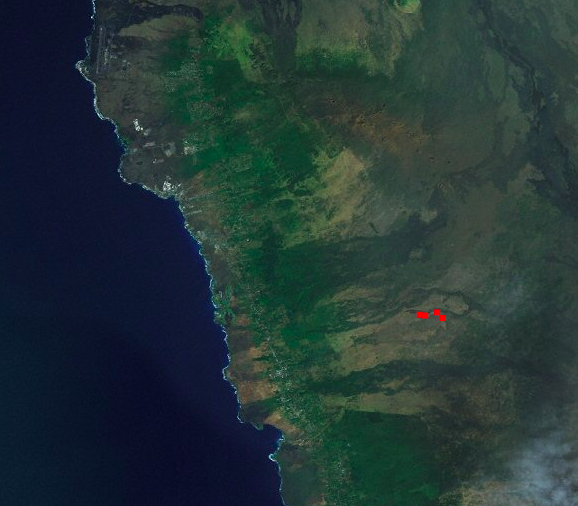 Hokukano Ranch fire as detected by NASA satellite. Firefighters are working to douse a brush fire ignited by lightning Sunday afternoon in a remote area of Hokukano Ranch. Responding to a 2:04 p.m. report, firefighters from Captain Cook arrived at the scene 7 miles up Hokukano Ranch Road to find two moderate-sized brush fires burning about 50 acres in a very remote area with no radio or phone coverage, according to a media release from the Hawaii Fire Department. The department noted that someone witnessed lightning strikes in the area around the time the fire started.